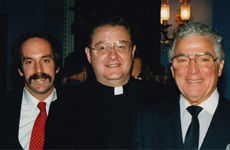 Sean Mc Manus with Mario Biaggi and Robert Blancato in 1987. Martin McGuinness has announced that he is resigning as Deputy First Minister over the refusal of Arlene Foster to step aside in the “cash for ash” row. The Sinn Féin politician, whose health has visibly deteriorated over the Christmas period, made his announcement at Stormont Castle on Monday afternoon. He is standing down as Deputy First Minister from 5 pm. As theirs is a joint office, Ms. Foster’s role as First Minister will also cease, although she will still carry out some minimal non-executive functions. 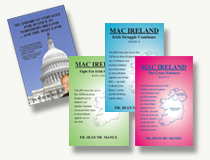 “There will be no return to the status quo,” said Mr. McGuinness who called for snap Assembly elections to be held. There are now seven calendar days for Sinn Féin to nominate an Assembly member to replace him. Mr. McGuinness was adamant the party would not be changing its position, although if the DUP leader did agree to step aside temporarily, it is possible the Sinn Féin position could alter. Hitherto, however, Ms. Foster has insisted she will not temporarily step aside, pending an investigation into the renewable heat incentive (RHI) scheme which ultimately could result in an overspend of up to £490 million. If the current position holds, then, after seven days, it will be for the Northern Secretary James Brokenshire to call Assembly elections in Northern Ireland. Mr. McGuinness looked quite ill when he gave a short press conference at Stormont Castle on Monday afternoon. He said, however, that his health was not a factor in his decision to resign. Asked would he stand again if elections are called in the coming weeks, he said he would address that matter at the time. “Over the last ten years I have worked with DUP leaders and reached out to Unionists on the basis of equality, respect, and reconciliation,” said Mr. McGuinness. “Over this period the actions of the British government and the DUP have undermined the institutions and eroded public confidence. Sinn Féin will not tolerate the arrogance of Arlene Foster and the DUP,” he added. Ms. Foster has made it clear she is prepared to see Assembly elections rather than accede to the Sinn Féin demand that she stand aside as First Minister. In a message to Mr McGuinness – before the announcement of his resignation – she said: “If he is playing a game of chicken, if Sinn Féin are playing a game of chicken, and they think we are going to blink in relation to me stepping aside they are wrong – I won’t be stepping aside. And if there is an election, there is an election. “I take my directions from the electorate and certainly not from Sinn Féin,” she told her local paper, the Impartial Reporter in Enniskillen. “However, the Government is very mindful of the need to protect the integrity of the principles and institutions of the Good Friday Agreement. In this regard, both the effective functioning of those institutions and respecting the principles of partnership and equality are of critical importance.